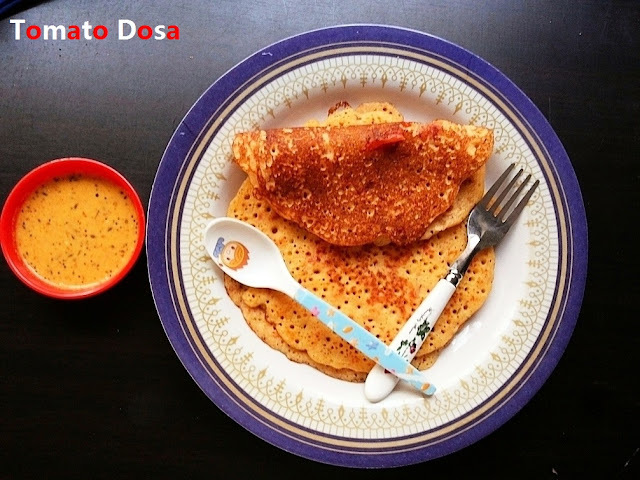 Tomato Dosa is a slight variation to the usual dosa that we prepare. This is a good option to make your kid benefited with the goodness of tomatoes along with the rice that we use for making dosas. My mom usually prepares instant dosa using wheat flour, gram flour, all purpose flour and joward flour by adding chopped veggies to it. For this I usually add chopped tomatoes/ grind the tomatoes and then add the juice to the usual dosa batter. 1. Soak rice and black gram separately for atleast 3-4 hours in enough water. 2. Grind soaked rice and black gram together in a grinder, add salt and keep it for fermentation overnight. 3. Grind tomatoes and add it to the fermented dosa batter. 4. Crush cumin seeds, carom seeds and add it to the batter. 5. Add chopped green chilli. Mix well. 6. Heat frying pan on medium flame. Apply oil and spread dosa batter over it. Flip on the other side when cooked. Cook on both the sides and serve hot with peanut chutney.